World famous trekking awaits in Torres del Paine National Park. Each valley, peak and pass hides its own treasures, be it hanging glaciers, vast pampas, twisted metamorphic rock or ice blue streams. No two days are the same, but one thing is for sure, the notorious buffeting Patagonian wind is sure to make an appearance. We partner with our trekking guides and operators in Torres del Paine to set up and run small group hikes with a maximum of eight people. Whether you are a solo traveller looking to join a group, a couple looking for a private trek, or friends looking for a group trip, ask us how to find the perfect hiking experience. The iconic W Trek visits each of the park's most famous highlights. At four days long, it's achievable for anyone in good shape with some hiking experience, and you can stay at the refugios along the way. The Full, or O Circuit is ideal for more experienced hikers. On the Circuit you can visit all the main highlights of the park, but also circle around the quieter northern edge of the park, where you'll have the stunning views almost to yourself. Lose the crowds completely by exploring deep into the park's quieter corners. Torres del Paine offers a number of off-the-beaten-track trails for adventurous souls with some hiking experience, which offer a completely different experience of the park. The Ascensio Valley offers you the best views of the mile high granite towers that give the National Park its name. The French Valley leads you past hanging glaciers and an amphitheatre of pinnacles and peaks. The Grey Valley, dominated by views of Lago Grey and the Grey Glacier. Cosy mountain huts nestled into the mountains allow you to complete the trek in four or five days with just a small rucksack. The W trek is great for less experienced trekkers on their first multi-day trek, those who want to see the highlights of the park in a limited amount of time and those on a budget. 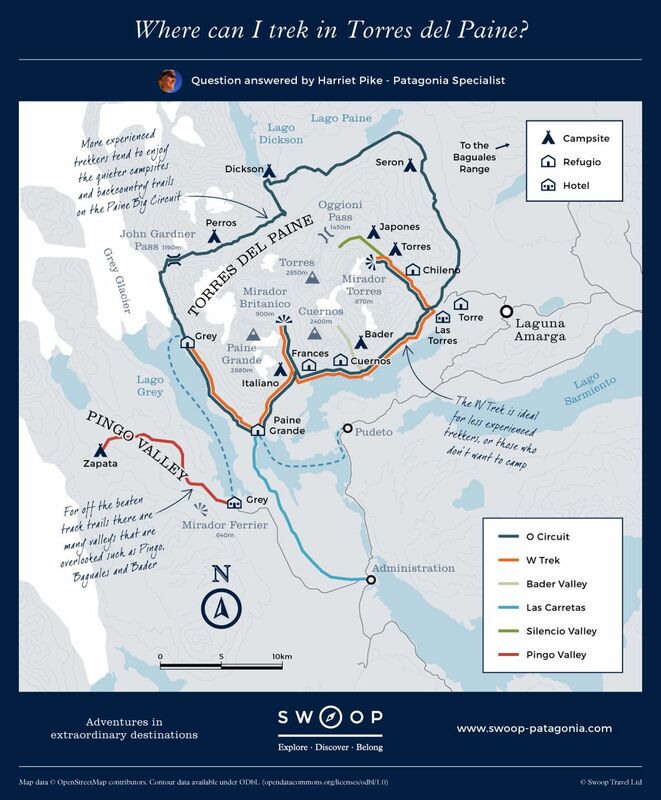 For more experienced trekkers, walking a full circuit of the Paine range promises that you see the classic highlights of the park including the towers and hanging glaciers, but also visit the northern part of the park where far fewer visitors venture. Typically it's tackled anti-clockwise, allowing you to take in the awe-inspiring view of the Grey Glacier and Southern Patagonian ice field reaching out to the horizon. The 65-80 mile (105-130 km) circuit trek can be completed in between 7-9 days. You will need to camp at least 2 nights, but the sheer beauty of the views from the campsites are enough to win over even the most passionate of indoor sleepers. For adventurous souls who want to avoid the crowds and discover some of the hidden treasures of the park, our remote hikes ensure you'll be exploring where few feet fall. While there are many secluded campsites and estancias to base yourself at, getting off-the-beaten-track doesn't mean having to rough it. Many of the luxury lodges include trips into these more remote corners. If you want to see all the highlights of the park but not compromise on accommodation, Torres del Paine's luxury lodges and eco-friendly camps offer some breathtaking spaces to return to after a long day's hiking. Each day you will travel to the trailhead by vehicle from where you and your guide can hike. Not only will you be guaranteed a hot shower and an excellent meal at the end of each day, but you can also pick the hikes and excursions the night before, using the experience of your guides to make the most out of every day. It was knock-you-down wind, two steps then brace. Below us you could see squalls ripping across Nordenskjold lake. Ahead of me I heard an American guy shout, "This is Patagonia man!". He was right. Amazing! It's a land of immense beauty, I've seen nothing like this. We saw Fitz Roy in the best weather possible and it takes your breath away. Grueling hike to the base of the towers in Torres del Paine brings a magical moment of first seeing them in the clearing in the clouds and staying in full view. I'm not sure I could have booked all this without you guys; it was a wonderful trip - challenging, adventurous and fun! Each of my three treks was quite different, but all with interesting and well informed guides and outstanding landscapes. What a wonderful, mind-blowing, refreshing experience. There are simply not enough positive adjectives to describe our time in Torres del Paine. Thank you for helping me plan one of the best experiences I've had! Do you want to finish off your trek by kayaking the length of the Serrano river, biking into the Baguales range in search of fossils or horse riding from Estancia to Estancia across the Patagonian Steppe. Why not link a multi-day kayaking, horse riding or biking trip with a trekking trip?